What Size Satellite Dish Do I Need? If you’re wondering what size satellite you need for your satellite dish installation let this be a guide to you. There are a few factors which affect the size satellite dish you require these are the expected signal strength and your location. The further you’re away from the satellites in space the weaker the received signal will be. As the satellites remain in geostationary orbit around the equator the further in the UK north in the UK you are installing your satellite dish the weaker the received signal will be,meaning that satellites dishes installed in the north of England and satellite usually require a larger dish that those using a comparable service in the south of England. There are other factors that will affect the size satellite dish you need, like the spot beams of the satellite themselves. In the UK for instance the satellite beam is focused tightly on the UK to limit to reduce the required satellite dish size and remove the possibility of non-paying UK TV licence payers receiving UK TV. Obviously being an island(s) surrounded by water makes this possible for the UK, but as this isn’t possible for other countries will use encryption instead. If you wanted to try and receive UK TV beyond the North of France, you would need a very large satellite dish indeed.Something like a 3m satellite dish is now required to receive UK satellite TV in Italy for example. Fortunately, the opposite is not true for people in the UK wanting to receive foreign TV as most TV services from Europe can be received with a relatively small satellite dish. Below I have suggested minimum satellite dish sizes for a multitude of satellites for satellite dish installations in both the North and South of the UK. Please note that these are suggested minimum dish sizes. It’s not to say that you it won’t work slightly smaller as satellite signal reception strengths can differ between transponders on the same satellite and a larger dish. A larger dish may also be beneficial on the basis that it would pick up a bit more signal and give a better Carrier to Noise(C/N) or Modulation Error Ratio (MER) reading resulting in a more robust signal less likely to fail in the wet weather. 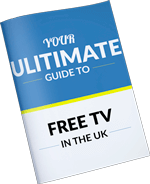 The overwhelmingly majority of satellite dishes installed in the UK are for Sky TV and Freesat which both also trade under different names including Sky+, Sky+HD, Sky Q & Freetime. For each of these services the same satellites are used. There are the Astra 2 satellites at 28.2E and the Eurobird satellite at 28.5E. There are currently 4 satellites occupying the 28.2E position but this does change over time. The suggested minimum dish size for Sky and Freesat is 45cm is the south and 60cm in the North of the UK. A 45cm Sky mini-dish style satellite dish is called a Zone 1 satellite dish and a 60cm a Zone 2. The two most common other satellites of use in the UK are the Hotbird satellites at 13E and the Astra 1 satellites at 19.2E. The Hotbird satellites primarily serve TV to the following countries Poland, Italy and North Africa. The suggested minimum satellite dish size for Hotbird reception in the UK is a 70cm, but you may want to go slightly larger into Scotland. Some of the popular subscription-based services on these satellites are Pulsat, Sky Italia and Tivusat which are Polish and Italian TV services respectively. The Astra 1 satellites also serve numerous countries including Spain, Germany, France & The Netherlands. The suggested minimum dish size in the South of UK is 60cm and 80cm in the North. Poplular TV packages from Astra 1 are Sky Deuthland & TNTSat which are German and French satellite TV services. The following section includes minimum satellite dish sizes for nearly all of the receivable satellites in the UK and also includes what countries those satellites primarily serve. Please note that the further away the satellite you receive is from due south the more difficult reception will be owing the how low the satellite will appear on the horizon. So, for the most East and West bearing satellites you will typically need to install your satellite higher. You will notice that some of the satellites listed have abroad range suggested on the minimum satellite dish size. Namely 23.5E and 16E.This is because some channels and transponders require a different sized satellite dish. I advise that you do your own investigation in these instances. If you need any more help with your satellite dish installation. We have a numerous other blogs about satellite dish installations. Follow the links below for more information. If you have any questions about this blog.Please do LEAVE A COMMENT in the comments section below.